There are two versions of this book here on EYB. 1) 1997 which has 272 recipes indexed. 2) 2011 which has 482 recipes member indexed. I just purchased the 25th anniversary edition 2016, which has 640 pages. The wrapper shows: 193382347X, which I assume is ISBN 10:1-933823-47X. The original version; second edition (New Food of Life) greatly revised to reflect availability of more ingredients in U.S., interest in lighter alternatives. Third edition (Food of Life) similar to second but with added Persian cultural material. This is an encyclopedic work- think Mastering the Art of French Cooking or Essentials of Classic Italian Cooking, but for Persian food instead. The book contains detailed information about Persian ingredients, and how to use them, as well as information on Persian culture that helps one better understand the context of the meals- really helpful if you are not familiar with Persian culture. The book also provides helpful instructions on how to make vegetarian versions of many of the meat-based dishes. For example, all of the khoresh (stews/braises), can be made vegetarian. The dishes I've tried so far have been delicious. This may not be the best book for anyone with a more casual interest in Persian cooking- because there are specialized ingredients required and a good amount of sweat equity needed for some of the recipes. I'm glad I went out of the way to find angelica/golpar, a new ingredient for me. It adds an almost funky, cheesy umami flavor to this dip (I played on that by adding a little feta on top). I was also lucky to spot some hard-to-find Seville oranges at the grocery store. This is good with pita chips. This is a very simple salad so it really needs the best and freshest ingredients to shine. I like the flavor of tomato skins and seeds so didn't take the step of removing them. I had pretty small scallions and definitely could have used more. This dip is completely refreshing. I omitted raisins, fresh thyme and oregano, but used extra parsley instead as it was what I had on hand. It goes perfectly with the chicken kabab recipe. "Mung bean and turnip soup" is an unfortunate name for such an interesting recipe. I made a trip to the Middle Eastern grocery to get kashk, which I've never tried before, to make this. I think a good substitute would be a mixture of something thick and creamy (yogurt, sour cream, or crème fraîche) with a strong, smelly, meltable cheese (like Brie). This would be nice with a couple of tablespoons of currants or even barberries added, because I love tiny, tart berries with cauliflower. Also, it has too much salt. 1/2 to 1 t. would be good. I made this using frozen favas from last summer. Similar to a frittata, but less eggy with lift provided by baking powder and since it is only 8 inch sized- a good option if you are only feeding a few. The dominant flavor was dill- which was heaven with the favas- it feels like you use tons of dill, but the flavor is perfect. I didn't have onions so used spring onions instead and wouldn't make that substitution again- I missed the oniony background notes. Really nice to bite into the sliced garlic as you make your way through this. Green garlic is really nice with eggs, and it was here too. I reduced the oil except for a few teaspoons since I was using a non-stick skillet. Baking powder is common in the kuku recipes in this book, but I didn't get much lift from using it here, so would probably omit the next time. Some herb from the marinade added an unpleasant bitter taste to the final product. Maybe it was the bay? Not nearly as appealing as the Chicken Kabab recipe from this same book. The classic chicken kebab recipe and it does not disappoint. I used boneless, skinless thighs and would do so again. I also had saffron water frozen in cubes a la Paula Wolfert, and that will save you a step here if you have that too. This kebab does cry out for a sauce (even with the moisture from the tomatoes)- I used a garlicky yogurt one. I love the herb-tamarind sauce! This a delicious mix of flavors, but was very oily for my tastes. If doing it again, I would slash or maybe eliminate the amount of oil added in step 6 of the recipe. 1. Halved the recipe. 2. Made it vegetarian by substituting Tofurky Lightly Seasoned Chick'n (don't judge) for the meat. 3. Converted it to a slow cooker dish by browning the onions and spices and then adding them to the slow cooker with 2 cups veg broth and the split peas and other seasonings. Cooked for 6 hours on low, then sautéed the Chick'n and apples, added them to the cooker, and cooked for 1 more hour. Ate with rice. SO GOOD. A little time-consuming but very nice and less sweet than I expected (which is actually very good). I used my Vitamix blender instead of my food processor to make the almond flour. I either over processed the almonds or did some other thing wrong because I ended up with a runny batter than yielded flat and very sticky cookies (they stuck together horribly when stacked.) The flavor, though, was very very good. Using whole wheat pastry flour (note pastry not bread or all-purpose) and butter makes these cookies more authentic and absolutely lovely for an occasion where you want a delicate cookie. It's also worth sprinkling a small amount of crushed or ground rose petals over the top just before baking. This is okay, but it has an odd, ketchupy aroma and flavor that I'm not crazy about. We bought a too-big leg of lamb, so ground up a pound of it for kuku. The recipe starts with a sauté of lamb, onions and peppers in ghee. I did the lamb separately, then added it back into the onion mixture, instead of sautéing everything together, just to ensure the timing was right. Also, I added a small amount of fresh chiles to the called-for chile flakes. Parsley, chives, and lime juice are added, along with cumin. The eggs are mixed with cinnamon and curry powder. The instructions here say to add baking powder, which is not listed in the ingredients, and I neglected to add it. Didn’t seem to matter, but will try it next time. The lamb mix and the egg mix are stirred with breadcrumbs (I used Udi’s gluten-free bread). It baked for 50 minutes. This was absolutely delicious! Perfect level of spice, perfect cooking time. Happy to have leftovers, and looking forward to making another one someday. This came out good, but very oily. I was halving the recipe, so it's possible I miscalculated the amount of oil to use...In any case, trust your instincts (as I should have) and add less if it seems an unreasonable amount. I was surprised by how little of this I ended up with after I'd halved the recipe (which is mostly the same as the meaty version, but with the meat omitted). Maybe three small servings. I'd probably try replacing the meat with something else (like tofu, tempeh, or other vegetables) to bulk it up a bit. Filled out the meal with flatbread, yogurt, and (store-bought) olive tapenade, all of which tasted great together. This was really very good. The sauce had a wonderful sweet and sour note, which helped to cut through the richness from the pistachios. Make sure to cut the squash in small cubes- mine were about an inch and rather al dente. Publisher Mage Publishers, Inc., Washington, D.C. Completely redesigned for today's generation of cooks and food enthusiasts, the 25th Anniversary Edition of Food of Life: Ancient Persian and Modern Iranian Cooking and Ceremonies by Najmieh Batmanglij provides a treasure trove of recipes, along with an immersive cultural experience for those seeking to understand this ancient and timeless cuisine. This edition is a more user-friendly edition of the award-winning and critically acclaimed cookbook series which began in 1986. Food of Life provides 330 classical and regional Iranian recipes as well as an introduction to Persian art, history, and culture. The book's hundreds of full color photographs are intertwined with descriptions of ancient and modern Persian ceremonies, poetry, folktales, travelogue excerpts and anecdotes. The 2011 Edition of Food of Life is a labor of love. The book began in exile after the Iranian Revolution of 1979 as a love letter to Batmanglij's children. Today, as accomplished adults in their own fields, her two sons, Zal and Rostam, encouraged her to redesign the book for their generation. 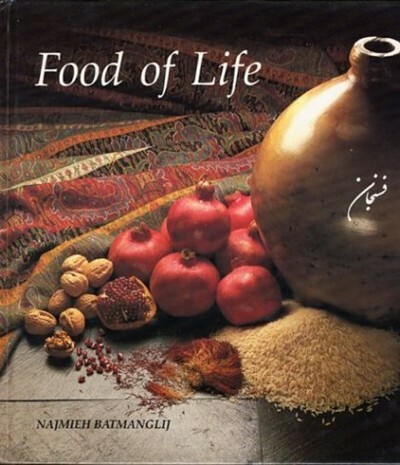 Food of Life, the title of the book, comes from the Persian words nush-e jan, literally "food of life"--a traditional wish in Iran that a dish will be enjoyed. For the updated 1993 edition the title was changed to New Food of Life. Now, for the 25th anniversary edition the title returns to its original name, Food of Life. *Choices for cooking recipes such as kuku in oven or on stovetop.